Although artificial intelligence (AI), machine learning, and cognitive computing are making increasing headway into every nook and cranny of the workplace, this shift does not mean that society will soon turn into the plot of a science-fiction movie about a dystopia in which humanity is pitted against the evil machines. 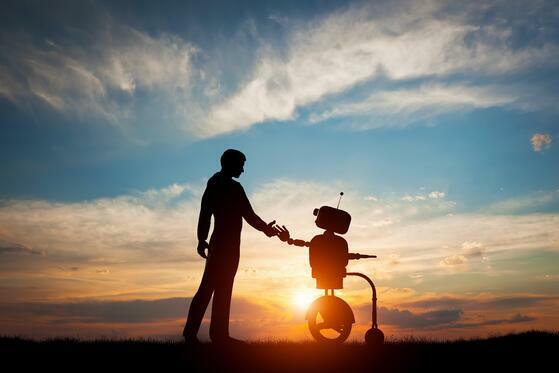 Rather, the future is much more likely to be one in which humans and machines work together in harmony, complementing each other’s strengths to transform business for the better. In some ways, the future is already here. Siri, Alexa, and self-driving cars are just a few examples of technology that is already capable of mimicking human behavior, and more and more businesses are embracing robotics, automation, and AI technologies. So how can HR prepare employees for the imminent arrival of tomorrow’s technology? Jobs for life” no longer exist, so workers must constantly reinvent their skills in order to keep up with current business needs. With the pace of change continuing to accelerate, companies need what Accenture calls a “liquid workforce” that has “flexibility fundamentally built into three areas: skills, projects, and the organization as a whole” and whose members are agile enough to grow and adapt with the company by performing a range of tasks rather than one fixed task. Similarly, Josh Bersin (of Bersin by Deloitte) suggests that companies adopt an approach similar to the one used to produce Hollywood movies: “people come together and bring their skills and abilities to projects and programs, they build and deliver the solution, and then many of them move on to the next movie later. Both of these approaches offer employees the chance to grow and learn—and, ultimately, to do more interesting and varied jobs. With this future on the horizon, the role of HR and the rest of the senior team is to identify key areas in which AI will have the biggest impact and to start putting programs in place to help people learn new skills. At the same time, HR must also stress the importance of lifelong learning and provide opportunities for employees to constantly upgrade their skills and experiences. Read: Are You Ready? The Future of Work Is Right Here, Right Now. Ironically, one consequence of the increase in automation is that humanity’s unique qualities are becoming more important. For example, soft skills are more in demand—and harder to find—than ever, with well over half the respondents in one recent survey of hiring managers saying they had trouble finding the soft skills they wanted.3 Although machines are better than humans at repetitive tasks, people handle uncertainty better, outperform machines at tasks that involve empathy, and excel at dealing productively with other people. To meet the growing need for soft skills, especially as more industries adopt Bersin’s work model, HR needs to help employees identify and improve their talents in those areas. Alongside soft skills, creativity is becoming a prized quality in the age of AI and automation. Lateral thinking and the ability to turn machine-generated hard data into useful insight are key human skills that demonstrate how human intelligence can complement technological developments. With this in mind, HR needs to hire and inspire workers who can think strategically and creatively. One way to identify such people is to ask them interview questions about their competencies in these area (such as how they used creative thinking in previous roles). The robots are coming. But that doesn’t mean the world is headed toward a bleak future. Rather than regard AI as a threat, people should see its arrival as an opportunity for them to showcase their human creativity and productivity at work. This article was published in Advanced Resources HR Insights Magazine and originally appeared on ReWork. About the Author: Janine Milne has been writing about HR, technology, and business for more than 20 years. This article originally appeared on ReWork, an online magazine sponsored by Cornerstone OnDemand featuring news and ideas on the future of work. Cornerstone OnDemand (CSOD) is a leader in cloud-based applications for talent management that helps organizations recruit, train, manage, and connect their employees. He thinks a lot about how technology can influence how businesses evaluate, motivate, and value their employees—especially in light of the rapid changes happening in today’s workplace. Looking for more workplace insight from the eyes of industry leaders? Access more great articles and back issues of HR Insights Magazine here.